In the fall of 2017, Sophie's Tale decided it was time to bring Mebo to life...make that a Plush Bear Life! The Sophie's Tale Team worked hard to make 3D plush Mebo, a real world doppelganger. From the aqua blue color of his soft fleece fur, to the roundness of his moon face and the ruby red of his Super Bear cape. This curious little bear is oh-so cute! Made of snuggly-soft blue fleece and hypoallergenic fill, little Mebo is now ready for adventures in the real world. 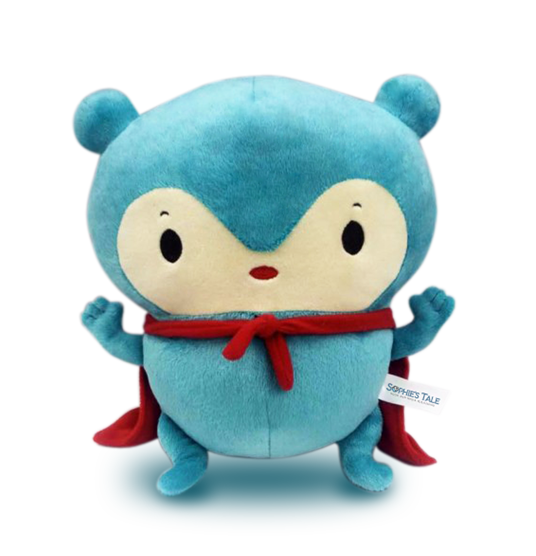 If you or your little one are looking for a cuddly plush Mebo of your own, little blue Mebo is available for adoption – just in time for little dreamers to snuggle up with on cold winter nights. Purchase Your Very Own Lovable Blue Mebo! Select either the Book and Bear Gift Set (Which is a super savings package!) or simply get yourself a Plush Mebo Bear.